For want of a trailer or any official images, most of our impressions of what the Michael Bay-produced, Jonathan Liebesman-directed Ninja Turtles reboot will look like have come through Halloween costumes. Or through closing our eyes, mentally combining what we know about Michael Bay’s way with characterization with the brief, one-sentence descriptors supplied in the Ninja Turtles theme song, then adding steroids. 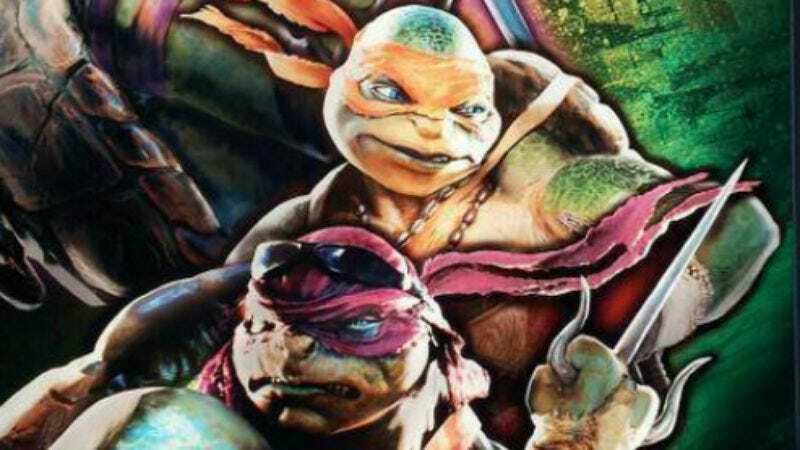 But thanks to some promotional art that’s surfaced over at Comic Book Therapy, we now have a much better idea of these extreme, next-generation Ninja Turtles and how their distinct personalities will be conveyed—besides the inevitably stereotypical dialect that comes out of their disconcertingly full turtle lips. We already know Michelangelo is a party dude, hence the addition of “party dude” stuff like cool chains and tattoos. Leonardo leads, so he’s in front, wearing more traditional samurai garb, his oddly human eyes bearing the stoic weariness of responsibility. Raphael is cool but rude, so he wears the Oakleys that are the signature eyewear of total dicks. And Donatello does machines, ergo he is a nerd. He has both nerd glasses—taped across the bridge, the better to fit his massive turtle face and to be a nerd—and goggles, for when he needs to be an extra nerd. All have prominent nostrils, because of realism. And as the reconfigured title suggests, none appear to be under 30, because human-sized, martial-arts-practicing turtles—most of whom dress like they’re headed to Ozzfest—who are also teenagers would be silly. And no one wants silliness in their Teenage Mutant Ninja Turtles movie.